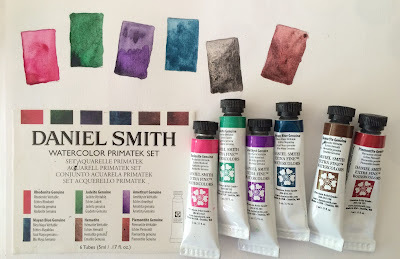 I think it is terrific that Daniel Smith have put together a couple of sets of 5ml tubes of colours. These are available in many countries, even where the full range of 88 5ml tubes may not be available. The 'Essentials' set contains six tubes, a warm and a cool red, yellow and blue. It's a great mixing set, or starter set for those getting into artist quality watercolours. It contains Hansa Yellow Light as the cool yellow - a great choice as it is transparent which suits most people better than the more opaque cadmium yellows. New Gamboge is the warm yellow - a lovely hue. It will mix wonderful oranges with Pyrrol Scarlet, the warm red. It will also mix lovely earthy greens with French Ultramarine, the warm blue. The cool blue, Phthalo Blue Green Shade, will mix bright greens with Hansa Yellow light or slightly more neutral and useful sap greens with New Gamboge. The cool red is the very pure and bright Quinacridone Rose, which will make the most beautiful purples with either of the blues. Start mixing three colours together and you can create all sorts of yellow ochre, raw sienna, Indian red, light red, burnt sienna and grey hues if you know what you are doing. Brenda Swenson has a wonderful demonstration using these colours on her blog here. 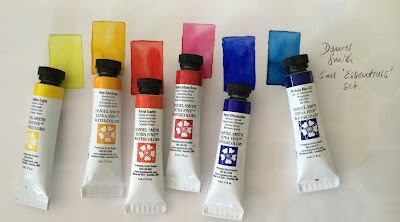 Many people who are new to watercolour struggle a little more with three-colour mixes and it speeds up your painting if you have some neutrals already in your palette so the next question might be - what to add to these essentials? The answer depends on what you are painting. This is another Daniel Smith set, containing six of their Primatek colours - they are all created from ground up minerals or stones. Rhodonite Genuine, Jadeite Genuine, Amethyst Genuine, Mayan Blue Genuine, Hematite Genuine and Piemontite Genuine. If you don't have the Primatek set, you might like to add some other convenient colours, perhaps a 'landscape' or 'urban sketching' extender set. Here are some suggestions. An earth yellow is useful - shown is the semi opaque Yellow Ochre but I also love the granulating Goethite (not available in 5ml tubes) or the slightly more orange and transparent Raw Sienna. Mont Amiata Natural Sienna is a transparent yellow ochre colour, though also not available in 5ml tubes. An earth yellow is useful for mixing olive greens and for use in landscapes. I find Burnt Sienna invaluable and use it with ultramarine to make a huge range of colours, or alone and watered down to make a skin tone. If you are doing landscapes or urban sketching you might like to add a couple of wonderful convenient greens such as Sap Green and Undersea Green, pictured. I like Cerulean Chromium as a sky blue, often mixed with Ultramarine. It is not as staining as Phthalo blue so is an excellent third blue option. Buff Titanium is another very useful paint for Urban sketching and landscapes, though it is also useful in portraits. Daniel Smith earth and landscape watercolours - Yellow Ochre, Burnt Sienna, Sap Green, Undresea Green, Cerulean Chromium, Buff Titanium along with Moonglow and Jane's Grey (custom mix). If you choose to add a neutralised orange (burnt sienna) and one or two of the neutralised greens (such as Undersea Green), you might also like to add a neutralised purple. The one shown is a three-pigment mix called Moonglow and it is another lovely granulating colour. It is also a useful shadow colour. Bright secondaries are easy to mix with the Essentials set; more neutral oranges, purples and greens may take three pigments to create. You may wish to add a dark - this is my mixture of Burnt Sienna + Ultramarine, but you may choose to add a Payne's Grey or Neutral Tint or make a mix of your own as a convenient dark. Indian Red - an earth red not shown above - is another useful urban sketching colour but it is very opaque and powerful and can be difficult for beginners to use. Watered right down it is a lovely soft earthy pink - suitable for lips and cheeks in portraits. You can mix the hue with Pyrrol Scarlet and Phthalo Blue GS. The essentials set is also a good start if you wish to get my Ultimate Mixing Palette set in 5ml tubes. Use the Hansa Yellow Light instead of Hansa Yellow Medium, use New Gamboge instead of Quinacridone Gold, then add 5ml tubes of Buff Titanium, Yellow Ochre (instead of Goethite), Burnt Sienna, Indian Red, Raw Umber, Cerulean Chromium, Permanent Alizarin Crimson (instead of Pyrrol Crimson), Phthalo Green BS and make a grey from Burnt Sienna and Ultramarine. I have a question about something I believe I read either on this blog or the WetCanvas boards yonks ago. I was looking into the topic of sunset painting and avoiding greens when painting transitions from yellow to blue patches of sky. Someone mentioned that there was a particular pigment (some kind of earth yellow, if I remember correctly) that didn't mix green when introduced to blue paints. Would you happen to be able to shed some light on it? Yes that's an observation I have made on my website and on Wet Canvas - it's a special property about Raw Sienna. If you use a Raw Sienna made from PBr7, not a yellow pigment, it will not turn green when mixed with a blue. Daniel Smith raw sienna (PBr7) will go slightly grey but not green, Mont Amiata Natural Sienna (PBr7 but a lovely yellow ochre colour) will also not go green with a blue. If you are using a raw sienna hue you are much more likely to get greens. Fabulous! This is exactly what I was looking for. Thanks so much, Jane! My two sets of paints arrived today and I can't wait to try them. Just to say thank you for all the information you share. It always inspires me to try again.